A couple of nights ago, we shared a video on our Facebook page that showed the massive cylindrical aquarium at the Gulfstream Casino busting a seam and emptying thousands of gallons onto the casino floor. Just thinking we had stumbled across another interesting video on the net, we had no idea how much back and forth conversation the clip would stir up. Comments on the video and by many social media users placed blame squarely on Living Color Aquariums, a large aquarium install company in Florida and the stars of the Nat Geo Wild television show “Fish Tank Kings”. Upon seeing the blame and the viral explosion of the video clip, the owner of Living Color came out with a press release to shine a little more light on the situation. According to the press release and subsequent news articles, the massive aquarium installed at the Gulfstream Casino was not built by Living Color Aquariums. Instead, the acrylic aquarium was built by Reynolds Polymer Technology, Inc., of Colorado Springs. Living Color assembled the coral insert and installed the tank in the casino back in 2006. A third, unnamed company performs all of the stocking and maintenance of the aquarium and have been doing so since it was installed. The aquarium leak at the Gulfstream Casino in Hallandale Beach, FL on Sunday September 2nd was a very unfortunate incident. Living Color Enterprises DID NOT manufacture the Acrylic Cylinder at the Gulfstream Casino Aquarium. Living Color was involved in the Gulfstream Casino Aquarium and supplied the museum-quality Artificial Coral Reef Décor and sophisticated Filtration System for the aquarium. However, the physical Acrylic Cylinder was manufactured by another company. We are unable to comment on the aquariums’ condition prior to the incident because our company was not contracted to maintain the aquarium and our staff have not inspected the tank for several years. Fortunately, we have heard from media reports that all the animals were saved and are doing well. We have been informed that the acrylic manufacturer has been contacted and will inspect the aquarium this week. We will provide an update as soon as we have further information. 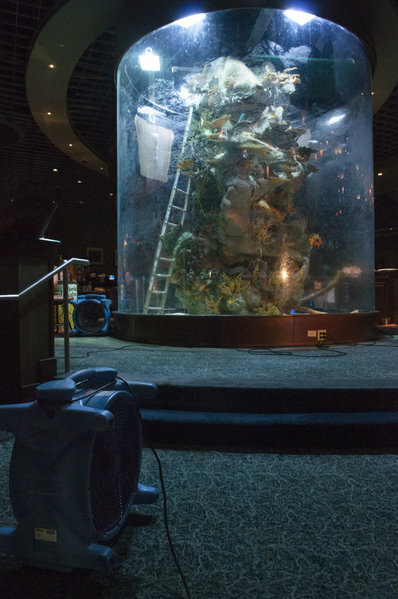 Regardless of who built the aquarium and who installed it, the casino floors were absolutely inundated with thousands of gallons of saltwater, causing the 100 or so guests to evacuate. The tank, which sat on the second floor apparently, caused slot machines and poker tables to be shut down and the leak trickled down through the floor to ruin machines on the first floor. All in all, the total damage to the casino will run approximately $125,000 per day simply because the casino cannot function in its fullest capacity. As for the cause of the leak, that is still under investigation. Catastrophes such as this are extremely rare, and all parties are looking into the how and the why of this major tank failure. On an interesting side note, the ever classy gang from Acrylic Tank Manufacturing, the stars of the other aquarium show “Tanked”, decided to help spread the misinformation about the aquarium failure on their Facebook page. Instead of gathering up the information before posting, they went right into mudslinging mode. After a little damage control by the Living Color Aquariums crew, ATM did post some updated information along with a weak attempt at maintaining peace. The statement by Acrylic Tank Manufacturing (ATM, aka the show “Tanked”) is now ironic 2 years later because they did in fact manufacture the circular tank at the T-Rex Cafe in Disneyland that also cracked a few days ago. It looks like no one has perfected the manufacture of large circular aquariums and it’s a big risk to have them.